You've been captured by a mad scientist, along with other testificates, who's about to perform tests on you and your cellmate. Your cellmate however is determined to escape from the lab. When the guards are out for a lunch break, your cellmate decides it's the time to strike. You manage to get out of your cell, however you still have to escape from the scientist. 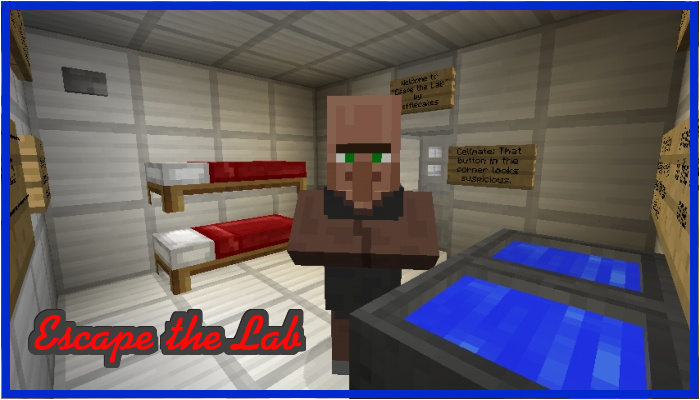 Escape the Lab has lots of puzzles, parkour, a maze and much more. Can you be creative with a bow and arrow? Can you crack the code? Do you think you'll be able to survive the parkour? Or get out of the maze? Find out now! Next to the main objective, there is also a lot of fun(ny) "side stuff" for you to do! Side challenge: Collect as many emeralds as you can to compete with other players! Tell us in the comments below how many you have found and/or vote on the poll. You cannot destroy any blocks (except snow) nor place any blocks. Collect as many emeralds as you can. Set your difficulty on 'Normal'. Do not trade with villagers. You can only save your Emeralds in the Ender Chests. And of course: no modding/hacking. Check out all the Let's Play's at my topic at the Minecraft Forum! It was pretty good, I really liked it, I got stuck on some levels and unfortunately had to cheat, but otherwise, pretty good.